ATVs are powerful, complex vehicles designed to deliver a thrilling ride over rough terrain. Operating them safely requires skill and knowledge, and the observance of basic safety precautions. Want Ad Digest offers links to the full range of ATV parts, ATV accessories and ATV safety equipment, including helmets, goggles, gloves and more, to help ensure a safe and enjoyable ride. Always wear a protective equipment. Most serious ATV accidents are head injuries to a driver who was not wearing a helmet. Required by law in many states, helmets should have stickers on both the inside and outside confirming compliance with standards of the Department of Transportation (DOT) or Snell Memorial Foundation, an independent agency that test protective headgear. Eye protection – Protective or face shield to protect against flying rocks, insects or debris. – Off-road style is best.Off-road jersey; shoulder pads/chest protectors are encouraged. over-the-ankle ATV boots offer the best protection. Do not drive on paved roads. ATVs are designed exclusively for rugged terrain and are difficult to handle on paved roads. In fact, driving an ATV on a paved road is the major cause of ATV fatalities. For these reasons, some states and local areas prohibit ATVs and other off-road vehicles on public streets and highways. Most ATVs are designed to carry one person, and are not equipped with handholds or footrests for passengers. The elongated seat on the single-rider ATV is designed to allow the driver to properly shift his or her weight to maintain control of the vehicle. A passenger can inhibit the driver’s ability to do so, possibly resulting in a crash or rollover. Never operate an ATV when impaired by alcohol or drugs. Safely operating an ATV requires your clear, unimpaired attention. Never drive and ATV when under the influence of alcohol or drugs, including some prescription and over-the-counter drugs, such as cold medicine and antihistamines, that can slow your reaction times. Never allow a child under age 16 to drive a full-sized ATV. In order to safely operate an ATV, the driver must use his or her body weight to help turn the vehicle. If an ATV is too heavy for the child’s body weight, the child will not be able to control the ATV. 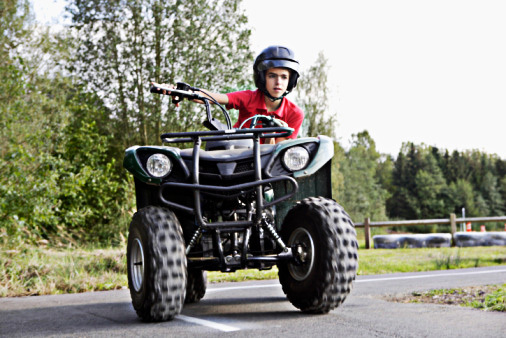 The ATV Safety Institute recommends that children under the ages of 12, not be allowed to operate an ATV, and that children age 12-16 ride in a quad ATV with an engine size of 90cc or less. Stay safe—and enjoy the ride!